Heading into Week 5 of the college football season the Big Ten still occupies the top two spots in the country with No. 1 Ohio State and No. 2 Michigan State setting the pace in both major Top 25 polls. The Buckeyes moved to 4-0 straight-up with last Saturday’s 38-12 victory against Western Michigan, but for the third week in a row they could not cover a heavy double-digit spread. They are now just 1-3 against the spread this season with the total staying UNDER in their last three games. Up next in their quest for a perfect season is a road game against Indiana in the Buckeyes’ conference opener. Ohio State has been listed as a 21-point favorite and BetOnline has set the betting odds for the total at 64. The Buckeyes have a SU five-game winning streak in their last five road games against the Hoosiers and they are 5-1 ATS in their last six trips to Memorial Stadium. The Spartans pounded-out a 30-10 win against Central Michigan this past Saturday, but they could not cover the 26-point closing spread on their home field. They are now a costly 0-4 ATS with the total evenly split 2-2. Purdue comes to town this Saturday in Michigan State’s Big Ten opener and the spread in this game has been set at 22 for the home-town favorites. The total line for this game has been set at 56.5. The Spartans have won 18 of their last 19 home games SU and against the Boilermakers they are 4-2 SU in the last six meetings on their home field. The total has stayed UNDER in five of the last seven matchups at Spartan Stadium. All told, the Big Ten has five teams in the latest AP Top 25 with Northwestern next on the list at No. 16 followed by No. 19 Wisconsin and No. 22 Michigan. Of the three, the Badgers could face the toughest test this week. They are seven-point home favorites against the Iowa Hawkeyes, who come into this conference opener 4-0 SU and 3-1 ATS. Wisconsin is just 3-8 ATS in its last 11 games against Iowa and 1-4 ATS in its last five home games against the Hawkeyes. I had Wisconsin covering against Hawaii as my Big Ten “pick of the week” to run my overall record on the year to 3-1. For this week’s top pick I have turned my attention to this Saturday’s Minnesota at Northwestern game at Ryan Field. The Golden Gophers had their hands full last Saturday against Ohio University and they needed a last-minute score to pull-out a 27-24 win as 7.5-point home favorites. They are now 3-1 SU on the year with a 1-3 mark ATS and the total has stayed UNDER in three of the four games. Minnesota has struggled to win on the road in recent years with a SU 8-15 record in its last 23 road games and it comes into this game with an inconsistent offense that is averaging just 19.3 points a game. Northwestern has climbed into the national rankings with a perfect 4-0 SU (3-1 ATS) start that includes a stunning 16-6 upset over Stanford as a 10-point home underdog and a hard-fought 19-10 win against Duke as a 3.5-point underdog on the road. The total has stayed UNDER in all four contests. The Wildcats do not have the most prolific offense in the world either with an average of 25 points a game, but its defense is ranked third in the nation in points allowed (8.8). 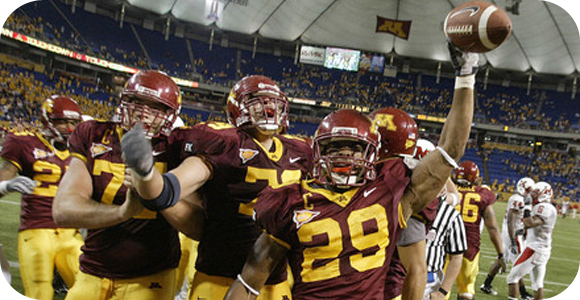 The betting trends in this matchup favor Minnesota with a perfect 5-0 record ATS in its last five road games against the Wildcats and this time around it comes in as a five-point underdog on the road. The total for this game has been set at 40 and while I would still consider a play on the UNDER, my “best bet” pick for this game is Northwestern breaking the current trend with a SU victory that covers the five points at home.